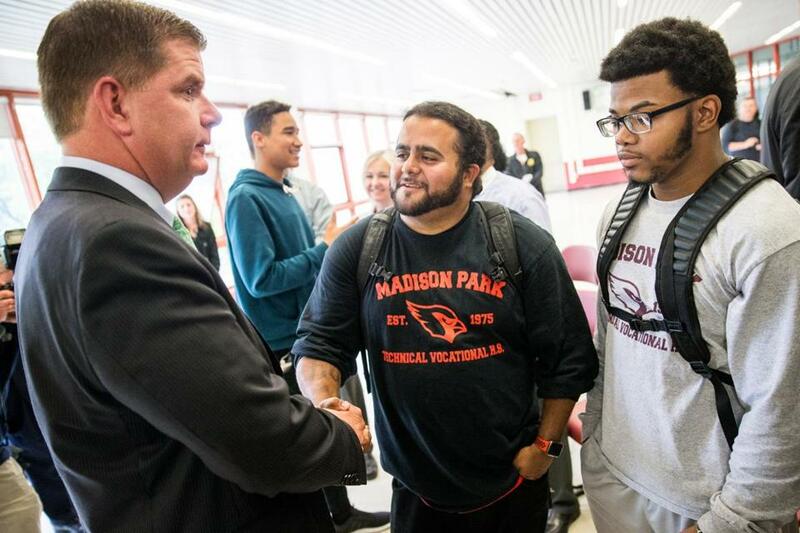 Boston Mayor Marty Walsh greeted teacher Genaro Ortega and student Ezra Howell. In an effort to provide teenagers a pathway to future prosperity, Boston and state officials announced an initiative Tuesday to allow high school graduates from low-income families in Boston to attend community colleges and state universities for free. The Boston Bridge program will be open to low-income graduates of the city’s school system as well as those from charter and parochial schools, starting with this year’s graduates. It will pay for the portion of tuition and mandatory fees not covered by federal grants and other scholarships. To qualify, students must meet the income guidelines for a federal Pell grant. The US Department of Education was unable to provide income parameters Tuesday, but according to scholarships.com students from households with incomes of $50,000 or less typically qualify. Mayor Martin J. Walsh and Governor Charlie Baker announced the program at an afternoon press conference at Madison Park Technical Vocational High School in Roxbury to the applause of dozens of students who sat before them. “Education is the key to upper mobility,” Walsh said in his opening remarks. But the program places several restrictions on participation. Most notably, students must enroll full time at either Bunker Hill Community College, Roxbury Community College, or MassBay Community College and earn an associate’s degree within 2½ years. From there, they can transfer to a state college or university, where they must maintain a 3.0 grade point average and graduate within two years. “This is one more tool in the tool box that students can choose to pursue” a college education, Baker said. Several students after the press conference said the program could go a long way toward easing the financial burden of higher education. But some college affordability advocates criticized the program for being too narrow, saying it will do little to address the root causes of escalating college tuition and fees on state campuses, some of which has been driven by millions of dollars in cuts in state funding. “I don’t think we should be overly hyping this program,” said Zac Bears, executive director for PHENOM, a grass-roots coalition of students, faculty, alumni, business leaders, families, and others who are pushing for high-quality, debt-free public colleges. The Boston program is the latest effort by states nationwide to address the growing cost of college tuition and the crushing student debt it creates. Since 2014, 35 state legislatures have considered bills that included some kind of provision regarding free college tuition, according to the Education Commission of the States, a professional organization of state education commissioners based in Denver. But only seven states — New York, Tennessee, Arkansas, Minnesota, Montana, Rhode Island, and Oregon — have passed bills, the group said. Sarah Pingel, a senior policy analyst for the group, said that concern over college costs usually extends beyond low-income students and looks at addressing the financial plight of middle-class families. Bills often fail amid swirling debates about how the states could afford to pay the tuition bills themselves, she said. Under the Boston Bridge program, the city will cover the costs of community college after deducting any Pell grants and discounted tuition offered through another state program. Annual tuition and fees are roughly $5,000. The city and state will split the costs for the tuition and fees at the four-year institutions, which can be about $9,000 or more at state universities and as much as $15,000 at the University of Massachusetts Amherst, excluding room and board. Pell grant amounts can exceed $5,000, although not all students who are eligible receive the full amounts or any money at all. Boston Bridge is the outgrowth of two state and city college affordability programs that were launched last year but attracted few students. In its first year, Boston’s Tuition Free Community College program is providing free tuition to 50 low-income Boston Public Schools graduates who attend Bunker Hill Community College, MassBay Community College, or Roxbury Community College, according to the city. Similarly, the Commonwealth Commitment is giving discounted tuition and fees to 80 Massachusetts residents who earn a bachelor’s degree at any public four-year institution after first earning an associate’s degree at any one of the state’s community colleges. Students must maintain a 3.0 grade point average and graduate within 4½ years. Walsh and Baker defended the record of these two programs Tuesday, saying that each got off to a late start last year, noting the initiatives were announced in the spring. Walsh said early data on the 50 students enrolled in the Boston program are encouraging. Some 94 percent completed their first semesters this year at community colleges and 73 percent earned course credits that can transfer to a four-year institution. In an election year, the announcement generated some buzz on the campaign trail. Newton Mayor Setti Warren, a Democrat hoping to challenge Baker, issued a press release shortly afterward, saying the Boston-based program is not a solution for Massachusetts. “Every child in Massachusetts, regardless of where they are born, who their parents are, or how much money they have, should be able to go to college without signing their lives away to crushing student loan debt,” Warren said in a statement.